Exposed tree roots may look cool in photos; however, most homeowners know they are trip hazards, make mowing difficult, and an eyesore. What most homeowners don’t know is that exposed tree roots are also bad for the tree. 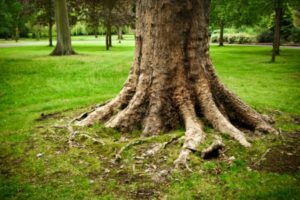 When the roots are exposed to the elements they can be scalded by the sun, trampled by foot traffic, and have trouble retaining moisture, which is why it’s important to fix exposed tree roots. But before you learn how to fix these exposed roots, it’s best to learn how they became exposed in the first place. Why Do Tree Roots Become Exposed? Roots are naturally found in the top 6 to 12 inches of the ground; however, they can become exposed if they are forced to by the outside forces like erosion and lack of space. Erosion: Rain, stormwater runoff, and wind can erode the soil around the tree leaving the roots exposed. This is especially common when trees are planted on hills or slopes. 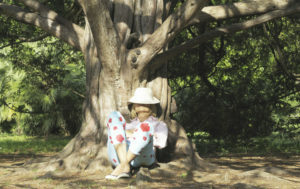 Lack Of Space: Trees planted in confined spaces may not have enough space for its roots. When the growing roots encounter obstacles such as sidewalks, pavement, or buildings they may start growing closer to the surface and even start to crack pavements and sidewalks. Maple trees and fast growing shade trees are prone to having exposed roots. If you are planting one of these types of trees take precaution to make sure the tree is planted in soil that won’t erode and that has enough room for roots. Over the years, most old trees will naturally develop some exposed roots as well. How Do You Fix Exposed Tree Roots? The best way to fix exposed tree roots is to create a mulch bed around the tree. This will protect the exposed roots and provide lots of benefits for the tree. Help’s the soil that’s left accumulate and retain more nutrients. Retains water helping keep the roots moist. Insulates the roots helping to provide a buffer from heat and cold temperatures. First, try to remove as much of the grass that is growing between the exposed roots (where you plan to mulch). This is so that the grass does not grow right through the mulch you apply. Do not use a lawn mower, weed wacker, or round up as these will cause damage to the exposed roots. Apply the mulch in a ring covering the exposed tree roots. The mulch should be about 2-3 inches deep and should not touch the trunk of the tree. You do not want to create a mulch volcano. Covering Them With Top Soil: when you add top soil on top of the exposed roots you risk adding too much or packing the soil too tight which would stop the roots from getting the water and oxygen they need. The roots may also grow right through the topsoil before long. Plus, if your roots are exposed because of erosion the new top soil you add will just be eroded again in a year or two. Planting A Garden Over Them: Many homeowners may be tempted to plant a garden on top of the exposed tree roots. This is a bad idea. When you plant flowers or shrubs underneath a tree you are forcing your tree to compete with the new plants for water and nutrients. These situations typically end with either your plants or your tree dying. Solve your exposed root issues the right way. When using the mulching solution you will create lots of benefits for your tree while solving the problem of exposed tree roots.